Size matters. Stop giggling at the back. “It’s not the size of the dog in the fight, but the size of the fight in the dog.” That’s fair enough, but what about a fight between a dog and, say, a lion? The writer and philosopher Robert Anton Wilson argued that size is not a reality, but a construct of the mind. That kind of talk will get you nowhere in a shoe shop. Size is particularly important if you want to raise £1m in one night. 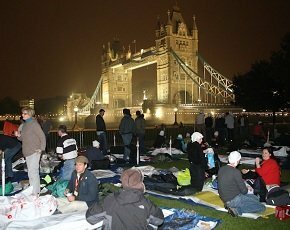 So this year, Byte Night, the UK’s largest charity sleep-out event, will be bigger than ever before. We are hosting overnight sleep-out events in Belfast, Birmingham, Cambridge, Edinburgh, London, Manchester and Reading and inviting the best and the brightest from the technology and business community to join us for a night exposed to the elements. Last year we were joined by CIOs and IT directors from some of the UK’s most influential businesses. So far we have encouraged 583 people from across the UK to sleep out on Friday 4 October to raise money for young people at risk of homelessness. But we need many more people to sign up if we are to hit our £1m fundraising target. Why do we need to make more than £1m? Because, just as Byte Night is growing so is the size of the problem we want to solve. Figures released by the government last month revealed that the number of homeless households in England has risen 6% this year to more than 53,000. More than 30% of the individuals affected were aged between 16 and 24. By supporting Byte Night you are helping Action for Children tackle the root causes of youth homelessness. Action for Children works with young people at risk across the UK, such as those leaving the care system, young people at risk of family breakdown and those who are already without a safe place to sleep. Action for Children projects across the UK provide vulnerable young people with support they need to help get their lives back on track, from emergency accommodation to longer-term supported living solutions with mentoring and guidance. We give them the space and security they need to work out what they want from their lives and steer them away from the dangers of a life spent on the streets. Registration for this year’s event is open and we are confident that we can triple our current number of sleepers and encourage over 1500 people to join us on Friday 4 October at events across the UK. Together we can keep vulnerable young people off the streets and help them to build better lives with access to education, hope of a career and somewhere to call home. Sign up to sleep-out now at www.bytenight.org.uk.